Thinking about going vegan and wondering what in the world you’ll be able to eat? You’re not alone! Because animal products are everywhere and many popular foods contain them, it might seem as though your choices will be quite limited after you transition to a plant-based lifestyle. Luckily, vegan foods are becoming more popular. Plant-based eating is catching on, and vegans are no longer a fringe element. At first blush, it may seem like all vegans are devoted to causes surrounding animal rights. 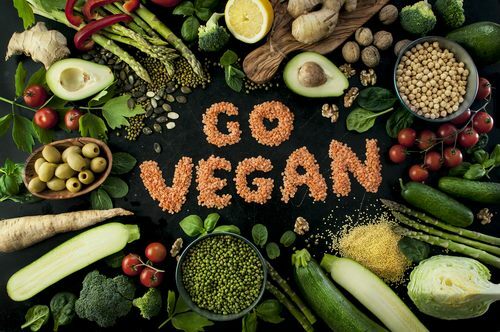 While it’s absolutely true that many people are attracted to a cruelty-free way of life, it is also true that many vegans choose to eat the way they do because of the many health benefits they receive. Entire books have been written on the benefits of following a vegan diet. In general, though, here are some of the main ways your health will improve as you continue to eat plant-based foods over time. Reduced risk of cardiovascular disease – Studies have proven that a plant-based diet reduces the risk of heart disease, prevents heart attacks, and prevents stroke. 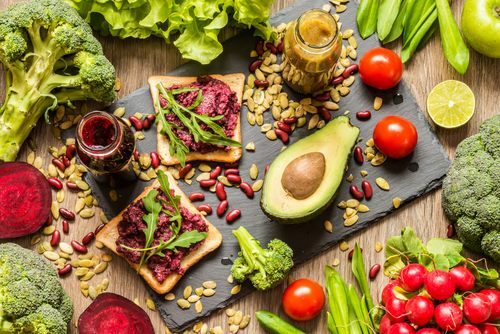 Reduced risk of type 2 diabetes – With a vegan diet rich in whole plant-based foods, it is possible to reduce your risk of type 2 diabetes and even reverse pre-diabetes. Some type-2 diabetics have successfully reversed diabetes with vegan diets. Note that fatty foods, heavily processed foods, and high-sugar foods should be avoided for the most part: occasional treats are OK, but only in small amounts. Reducing high blood pressure – A good vegan diet is rich in whole grains, helping to bring blood pressure into balance. Reduced cancer risk – Colon cancer, prostate cancer, and breast cancer risks are lower in those who follow a vegan diet. Better eye health – Following a vegan diet rich in colorful fruits and vegetables can head off age-related eye problems including cataracts and macular degeneration. Reduced risk of osteoporosis – The dairy industry has done a good job of convincing people that cow’s milk is essential for strong bones; however, calcium, adequate protein, low sodium, and high potassium intake are the cornerstones for skeletal health. A healthy vegan diet covers all four without the additional fat and cholesterol found in most dairy products. Weight loss – Most people lose weight when they transition to plant-based eating, and once excess weight has been lost, they find it simple to stay satisfied while maintaining a healthy body mass index. High energy – Bodybuilders and professional athletes are turning to veganism for good reason: It’s easy to enjoy a variety of foods and feel fantastic. Healthy carbohydrates and plant-based proteins are perfect for fueling the body, whether for intense workouts or for long days at the office. Healthy skin, hair, and nails – A balanced vegan diet includes plenty of nuts and seeds, which contain vitamins A and E to nourish skin, nails, and hair. Greater longevity – Several studies show that people who follow plant-based diets live longer, healthier lives than their meat-eating counterparts. These are just some of the biggest benefits of a vegan diet. Others such as better breath, less body odor, and relief from common ailments like migraines, allergies, and PMS are side benefits that can make life a lot more enjoyable. Gelatin, which is made using leftover animal parts such as sinews, skin, bones, hooves, etc. Vegan “junk” foods: It’s a good idea to limit treats like vegan ice cream, chips, and cookies to special occasions simply because they contain high amounts of sugar and fat, minus the beneficial nutrients found in whole foods. Highly processed mock meats and cheeses: Limit your consumption of these goodies, which tend to be high in salt and fat while offering fewer nutrients than their whole-foods counterparts. Note that some companies are now offering healthier versions that you can feel good about eating. Also, it’s worth noting that with a little effort and a few good recipes, you can transform whole foods into pleasing substitutes that are better for you. Vegan sweeteners: Agave syrup, date syrup, molasses, maple syrup, and other plant-based sweeteners are still sugar, and getting too much puts you back in the high-risk category for obesity and related issues including diabetes and heart disease. What about bee products? Most ethical vegans avoid honey, royal jelly, and bee pollen because of the way certain industry players treat the bees. Some who have access to local honey from small-scale beekeepers continue to enjoy it, and some even keep bees themselves, citing the important role pollinators play in keeping the planet healthy. Some dietary vegans – i.e., those who follow a plant-based eating plan for health benefits rather than out of concern for animal welfare – opt to limit or eliminate honey because it is a concentrated sugar source. It’s an interesting, multi-facetd subject worth researching; ultimately, the decision is yours to make. As you’re first getting started with your vegan diet, you’ll want to crowd out foods to avoid by focusing on the ones that will benefit you most. It’s a good idea to try a few new things at once, and to be sure that you’ve got some recipes to follow so that you know what to shop for. Stock up on herbs and spices, for example, as well as a few new things you’d like to try. Some of your old favorites might be vegan, already. Many foods carry vegan labels, plus there’s a useful app called Is it Vegan, which you can use to scan packaged items as you shop. The vegan shopping list that follows is divided into groups, each with some popular suggestions to help you get started. Because there are thousands of natural vegan foods to choose from, this list includes common, basic items that are easy to find at most stores. Feel free to be adventurous! It’s one of the things people most enjoy about following a plant-based diet. Beans, both dried and canned varieties. Look out for ready-to-eat beans that contain animal products; lard, bacon, ham, and beef often make their way into bean soups and refried beans. Condiments and pantry staples: Extra-virgin olive oil, balsamic vinegar, and mustard are a few favorites. Chile sauces and vegan salad dressings are some items you might want to try. Note that it’s possible to make your own vegan sauces and condiments without much effort, and that this strategy helps you avoid unwanted additives. Plant-based milks, preferably unsweetened: Try almond, cashew, soy, or another type that appeals to you. Fruits, mostly fresh in-season varieties. Dried fruits are high in sugar and sometimes contain additives, while the tinned variety usually comes packed in sugar syrup. Frozen fruits can be a nice addition to your basket, as they’re perfect for adding to smoothies. Herbs and spices: Get whatever appeals to you, but look out for spice blends with added sugar and chemicals. Note that fresh herbs are very nice to have, but their dried equivalents offer the benefit of being shelf-stable and easy to add to very basic foods (like beans and rice!) when you’re in a hurry. Vegetables, all kinds. While you’ll want lots of fresh veggies, you’ll be glad to find that the frozen type is equally nutritious, and low-sodium canned varieties can be good, too. Try to eat an entire rainbow of vegetables every day to incorporate a wide array of nutrients into your diet. Whole grains like quinoa, brown rice, and oats. You can also purchase whole-grain versions of your favorite breads, pastas, and other products – just look out for added sugars and other additives including dairy byproducts. To go organic or not? It’s a question that plagues most plant-based eaters. The good news is that more farmers are choosing organic production methods, and organic foods are becoming more popular as well as a bit easier on your pocketbook. Let your budget be your guide as you make this decision. In general though, the more organic foods you choose, the better for your body and the planet. 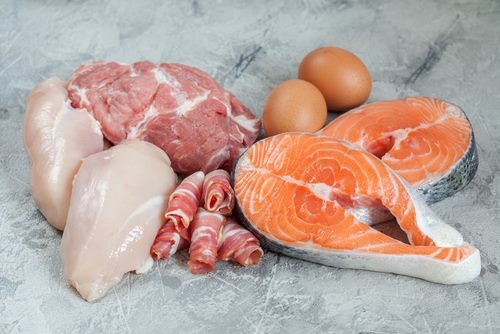 Iron is another nutrient that most people get from animal products. The good news is that there are lots of great vegan iron sources available too – and some of the best foods for your overall health happen to make their way onto this list. Note that vitamin C enhances iron absorption, so it’s a good idea to eat high-vitamin C foods such as broccoli, bell peppers, cabbage, Brussels sprouts, citrus fruits, berries, pineapple, or kiwi fruit along with your iron source. Tossing a bit of fruit onto your salad is just one great way to accomplish this goal. You can also take an iron supplement along with your B12, just to be sure that you’re getting enough. Don’t feel bad if you’re not ready to eliminate all animal products immediately. Most vegans slowly transition over the course of several weeks or even several months although there are some who make the change overnight. Plan your diet well. Ensure that you are getting enough vitamin B12, iron, calcium, zinc, iodine, and essential fatty acids by supplementing as necessary and basing your daily intake around whole plants and good fortified plant-based foods. Start simply by incorporating more nuts, seeds, whole grains, and legumes into your diet. Learn how to prepare tofu properly: Use a tofu press to get rid of the excess liquid, marinate it to add delicious flavors that appeal to your sense of taste, and baking, braising, or dry frying are a few ways to transform that hunk of plain bean curd into something so tantalizing that you can’t wait for your next taste. Have fun trying new techniques. With a food processer, a veggie spiralizer, and a few other kitchen tools, you can easily transform veggies, nuts, seeds, beans, and grains into culinary delights to please your palate while satisfying your nutritional needs. Check out online resources including top-rated vegan blogs and YouTube channels. You’ll find new ways to make old favorites, and you’ll enjoy yourself in the process. Take it easy. Don’t beat yourself up if you fall “off the wagon.” Try again at the next meal and continue working toward better health.